This is the wine that opened the mind of a white-wine-lover to red wines. (Go, Oliver!) From the beginning, he noticed it was a lighter color, and less likely to hit him over the head with the first sip. What he – and many people — don’t realize is that Chianti is from Tuscany which is a mountainous area toward the north of Italy, where the foods are not red-sauce based as in Naples or Rome. So the wines are a shade more subtle, paralleling the herbs and spices of the regional dishes. Chianti Classico carries the highest denomination of Italian wine, DOCG [Denominazione di Origine Controllata e Garantita]. In general Chianti Classico is one of the lighter reds, a wine with plenty of structure and some subtlety. 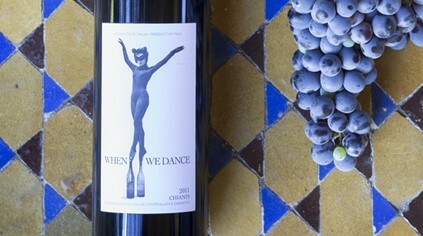 This 2016 vintage “When We Dance” is clear red-purple with paler edges. It has flavors of cranberry and raspberry with a tinge of earthiness. There’s good acidity and finely integrated, structural tannin. It opens nicely in the glass. The slight flaw is its short finish. Having read the reviews of earlier vintages, it seems this 2016 is a great improvement over its first iterations about five years before. Why would there be so much written about this wine? It comes from a Tuscan estate owned by Trudie Styler and Sting. Pairs well with hearty vegetables, pasta and sausage.